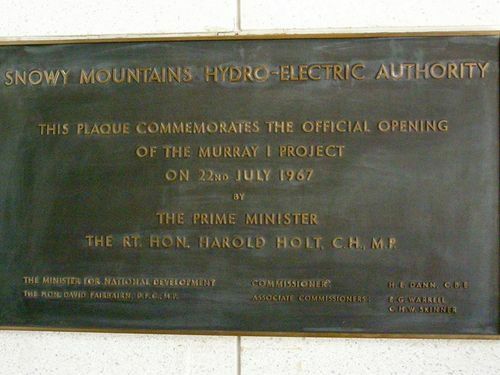 A plaque commemorates the official opening of the Murray 1 power station which was part of the Snowy Mountains Hydro-Electric Scheme. Murray 1 Power Station is located 10 kilometres (6.2 mi) north of Khancoban along the Alpine Way. The conventional gravity-fed hydroelectric power station has ten Boving Engineering UK-manufactured turbines, each fitted with ASEA-manufactured generators, with a combined generating capacity of 950 megawatts (1,270,000 hp) of electricity. The power station was completed in 1967, and has 460.2 metres (1,510 ft) rated head. Fed by the pumped flows via the Snowy-Geehi Haupt-tunnel from Island Bend Pondage, it receives water from the Geehi Reservoir on the Geehi River and discharges into the Murray Pondage. The station is capable of producing enough electricity to supply over 95,000 homes. THE RIGHT HON. HAROLD HOLT, C.H., M.P. The Honourable David Fairbairn D.F.C., M.P.